Hyperpigmentation is the darkening of an area of skin or nails caused by increased melanin. Hyperpigmentation can be caused by sun damage, inflammation, or other skin injuries, including those related to acne vulgaris. :854 People with darker skin tones are more prone to hyperpigmentation, especially with excess sun exposure. Many forms of hyperpigmentation are caused by an excess production of melanin. Hyperpigmentation can be diffuse or focal, affecting such areas as the face and the back of the hands. Melanin is produced by melanocytes at the lower layer of the epidermis. Melanin is a class of pigment responsible for producing colour in the body in places such as the eyes, skin, and hair. As the body ages, melanocyte distribution becomes less diffuse and its regulation less controlled by the body. UV light stimulates melanocyte activity, and where concentration of the cells is greater, hyperpigmentation occurs. Another form of hyperpigmentation is post inflammatory hyperpigmentation. These are dark and discoloured spots that appear on the skin following acne that has healed. Cushing's disease or other excessive adrenocorticotropic hormone (ACTH) production, because MSH production is a byproduct of ACTH synthesis from proopiomelanocortin (POMC). 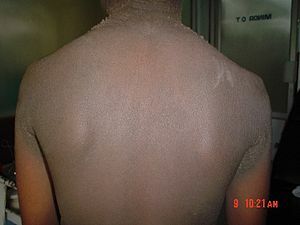 Acanthosis nigricans—hyperpigmentation of intertriginous areas associated with insulin resistance. Melasma, also known as 'chloasma' or the “mask of pregnancy,” when it occurs in pregnant women.— It is a common skin problem that causes dark discolored patchy hyperpigmentation. It typically occurs on the face and is symmetrical, with matching marks on both sides of the face. The condition is much more common in women than men, though men can get it too. According to the American Academy of Dermatology, 90 percent of people who develop melasma are women. Linea nigra—a hyperpigmented line found on the abdomen during pregnancy. Peutz-Jeghers syndrome—an autosomal dominant disorder characterized by hyperpigmented macules on the lips and oral mucosa and gastrointestinal polyps. Haemochromatosis—a common but debilitating genetic disorder characterized by the chronic accumulation of iron in the body. Mercury poisoning—particularly cases of cutaneous exposure resulting from the topical application of mercurial ointments or skin-whitening creams. As a result of tinea cruris. A physical examination including, wood's lamp examination and a detailed history, usually sufficient for diagnosis. There are a wide range of depigmenting treatments used for hyperpigmentation conditions, and responses to most are variable. Most often treatment of hyperpigmentation caused by melanin overproduction (such as melasma, acne scarring, liver spots) includes the use of topical depigmenting agents, which vary in their efficacy and safety, as well as in prescription rules. Several are prescription only in the US, especially in high doses, such as hydroquinone, azelaic acid, and koijic acid. Some are available without prescription, such as niacinamide, or cysteamine hydrochloride. Hydroquinone was the most commonly prescribed hyperpigmentation treatment before the long-term safety concerns were raised, and the use of it became more regulated in several countries and discouraged in general by WHO. For the US only 2% is at present sold over-the-counter, and 4% needs prescription. In the EU hydroquinone was banned from cosmetic applications. Oral medication with procyanidin plus vitamins A, C, and E also shows promise as safe and effective for epidermal melasma. In an 8-week randomized, double-blind, placebo-controlled trial in 56 Filipino women, treatment was associated with significant improvements in the left and right malar regions, and was safe and well tolerated. Procyanidin plus vitamins A, C, and E are used to make Pynocare, a product of Mega We Care or Mega Lifesciences public company limited. Other treatments that do not involve topical agents are also available, including fraction lasers and dermabrasion. ^ "Hyperpigmentation". Dermatalogic Disease Database. American Osteopathic College of Dermatology. Retrieved 2006-03-08. ^ a b Chandra, M; Levitt, J; Pensabene, CA (May 2012). "Hydroquinone therapy for post-inflammatory hyperpigmentation secondary to acne: not just prescribable by dermatologists". Acta Dermato-Venerologica. 92 (3): 232–5. doi:10.2340/00015555-1225. PMID 22002814. ^ Hyperpigmentation on Face (Acne Scars) Hyperpigmentation, Dark Spots, Acne Scars, Meladerm". ^ "Melasma". American Academy of Dermatology, Inc.
^ "Schimke immunoosseous dysplasia | Genetic and Rare Diseases Information Center (GARD) – an NCATS Program". rarediseases.info.nih.gov. Retrieved 2019-03-13. ^ Gupta, AK; Gover, MD; Nouri, K; Taylor, S (December 2006). "The treatment of melasma: a review of clinical trials". Journal of the American Academy of Dermatology. 55 (6): 1048–65. doi:10.1016/j.jaad.2006.02.009. PMID 17097400. ^ a b "Variety of options available to treat pigmentation problems | American Academy of Dermatology". www.aad.org. Retrieved 2017-02-12. ^ Mazurek, Klaudia; Pierzchała, Ewa (2016-09-01). "Comparison of efficacy of products containing azelaic acid in melasma treatment". Journal of Cosmetic Dermatology. 15 (3): 269–282. doi:10.1111/jocd.12217. ISSN 1473-2165. PMID 27028014. ^ Monteiro, Rochelle C.; Kishore, B. Nanda; Bhat, Ramesh M.; Sukumar, D.; Martis, Jacintha; Ganesh, H. Kamath (2013-03-01). "A Comparative Study of the Efficacy of 4% Hydroquinone vs 0.75% Kojic Acid Cream in the Treatment of Facial Melasma". Indian Journal of Dermatology. 58 (2): 157. doi:10.4103/0019-5154.108070. ISSN 1998-3611. PMC 3657227. PMID 23716817. ^ Hakozaki, T.; Minwalla, L.; Zhuang, J.; Chhoa, M.; Matsubara, A.; Miyamoto, K.; Greatens, A.; Hillebrand, G.G. ; Bissett, D.L. (2002-07-01). "The effect of niacinamide on reducing cutaneous pigmentation and suppression of melanosome transfer". British Journal of Dermatology. 147 (1): 20–31. doi:10.1046/j.1365-2133.2002.04834.x. ^ "Spotlight On: Niacinamide - FutureDerm". FutureDerm. 2007-10-30. Retrieved 2017-02-12. ^ Mansouri, P.; Farshi, S.; Hashemi, Z.; Kasraee, B. (2015-07-01). "Evaluation of the efficacy of cysteamine 5% cream in the treatment of epidermal melasma: a randomized double-blind placebo-controlled trial". The British Journal of Dermatology. 173 (1): 209–217. doi:10.1111/bjd.13424. ISSN 1365-2133. PMID 25251767. ^ "Cysteamine Cream® -- New Hyper Intensive Depigmenting Treatment". Scientis Pharma. Retrieved 2017-02-12. ^ Draelos, Zoe Diana (2007-09-01). "Skin lightening preparations and the hydroquinone controversy". Dermatologic Therapy. 20 (5): 308–313. doi:10.1111/j.1529-8019.2007.00144.x. ISSN 1529-8019. PMID 18045355. ^ "Hyrdoquinone Guidance published under the joint sponsorship of the United Nations Environment Programme, the International Labour Organisation, and the World Health Organization". ^ "Hydroquinone - Substance evaluation - CoRAP - ECHA". echa.europa.eu. Retrieved 2017-02-12. ^ Handog, Evangeline (2009-07-20). "A randomized, double-blind, placebo-controlled trial of oral procyanidin with Vitamins A, C, E for melasma among Filipino women". International Journal of Dermatology. 48 (8): 896–901. doi:10.1111/j.1365-4632.2009.04130.x. PMID 19659873. ^ "Laser Skin Whitening - Advantages and Disadvantages | Skin Whitening News". skinwhiteningnews.org. Retrieved 2017-02-12. Wikimedia Commons has media related to Acne.